I love fast recipe, especially on days when we work both long. Then its very good to have something for Dinner that is easy to prepare. I found the recipe for lemon spagetti in the current issue of Schrot & Korn where they publish a lot of recipe for easy “after work kitchen”. Cook the spaghetti like written on the package. In the meantime mix lemon peel, juice, olive oil and garlic oil with chopped parsley and season with salt and pepper. 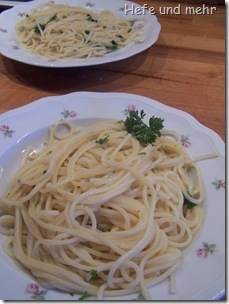 Mix the sauce with spaghetti and top with grated parmesan. Ist wirklich lecker! Und Dein Bild gefällt mir auch noch besser. I liebe auch diese schnell Receipt. (sorry, I read and understand german, but have troubles in writting it or speaking it). One has to have these quick recipes for days where there no time left for cooking.